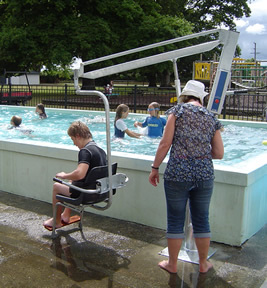 A simple to install fully self-contained unit, the Quinn Pool Hoist is proving very popular at school swimming pools and private spa pool areas. 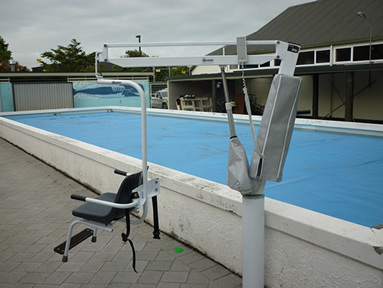 The Quinn Pool hoist has been has been developed as a semi-portable standalone unit that is easy to install needing no power or water supply at the poolside. It is available with either a seat or sling or both, can lift up to 150kgs and rotate 360 degrees, is easy to operate with a simple two button hand control. The hoist is powered by a high quality low voltage electric actuator and is supplied with two batteries and a charger. One battery remains on the unit while the other is being charged. The hoist frame is fully hot dip galvanized with stainless steel bolts and pins and self-lube bushes. The base mount is custom built to suit each situation and can be ether flush mounted onto existing surface or recessed.